NMM 3013. 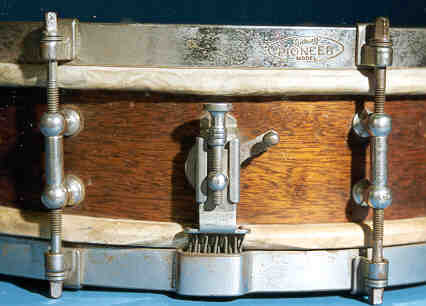 Snare drum by Ludwig & Ludwig, Elkhart, before 1946. This drum features a mahogany shell, natural finish, 4" x 14". Separate (double) tension. Eight tube lugs. Single-flanged metal rims (hoops) with hooks. Pioneer model strainer. The model name is stamped on the batter-head outside rim, as can be seen here. Arne B. Larson Collection, 1979.